This time of year, it’s customary to settle on a New Year’s resolution. That resolution often leads to a wish list. Companies—especially vertically integrated gas companies—have asked Esri to prioritize a special wish. Vertically integrated gas companies need a pipe-network feature that enables both a linear-referencing network and a geometric, or facility, network. Here are three reasons we need ALRP and UPDM. Transmission operators use linear referencing as their pipeline location language, generally. They don’t tend to build network models. Distribution and gathering operators, on the other hand, do just the opposite. For them, network models are the norm. 2. The Wrinkle: High-Pressure Distribution or Transmission—or Both? Let’s add a wrinkle. Actually, regulations add a wrinkle. A recent change in US regulations subject some high-pressure distribution mains to integrity regulations as if they are transmission pipes. In other words, how a pipe is operated is not necessarily how it’s regulated. Utility GIS needs to be flexible to accommodate this duality. This places a premium on the ease with which a vertically integrated gas company can modify its data, especially since further regulatory changes are likely. Sustaining asset integrity requires keeping accurate data on many factors, beyond those of the physical pipe itself. This is called event data. Event data includes information on natural and man-made environments, physical components (e.g., valves, coating type, wall thickness), and abstract designations (e.g., risk scores, depth of cover, road proximity). A pipeline GIS database typically contains a very large number of events. Keeping all this data together, while users edit databases and the network itself changes, poses utilities a challenge. In the past, an edit to the network wouldn’t automatically update related events. Related events include those sharing geography, for instance. As a result, someone needed to manually relocate each event, not to mention subsequently adjusting measurements up the pipeline. For pipelines that have existed for any period of time, these manual edits add considerable labor. This year, Esri introduces ALRP and UPDM to help you. ALRP and UPDM run off an enterprise approach to data, in which network information talks to each other. Together, ALRP and UPDM give you exciting ways to do your work—faster and better. ALRP fundamentally changes linear referencing and network modeling. It represents network components on a shared geodatabase, one comprised of point and line feature classes. It keeps everything together. When you reroute, for instance, ALRP relocates all coincidental events. Automatically. In addition, ALRP lets you define reactions to changes, such as those in route associations. UPDM supports ALRP. It’s what you know as a moderately normalized geodatabase model template. UPDM represents each physical network component—from wellhead to customer meter. It does this in one table object, so your data stays organized. So here’s to the year ahead. And keeping it all together. In late 2015, Esri will start releasing new capabilities for facility network management. These capabilities, which you can access across the platform from any device, optimize network performance. Look out for an enhanced information model and new productivity tools. We’ll post more on this blog. 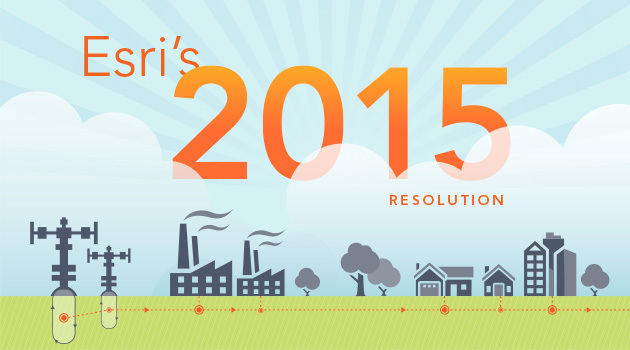 To learn more about Esri solutions for gas utilities, click here.